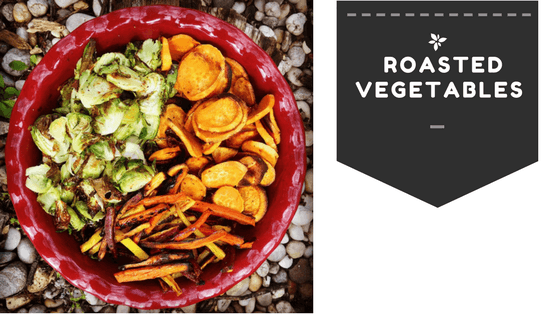 I know this post will seem simple but you have no idea how many fans ask just how you get your roasted veggies looking so exciting. Well let me tell you they really are exciting that I could literally make an entire tray full and within minutes I have little hands grabbing to stuff whatever colorful delights I decided to roast that day. I love roasting cauliflower, Brussels sprouts, broccoli, asparagus, sweet potatoes, and butternut squash and to tell you the truth I let the veggie speak for itself. Nothing fancy just plain old olive oil some sea salt and freshly ground pepper, (ok you can get a little fancy with some maple syrup, thyme, olive oil, salt, and pepper if you really need to). This is like roasted veggies for dummies so to speak, lol! Ok I crack myself up. Literally this is soooooo easy my kids can make them, you can make them and within minutes you too can have an easy healthy yummy snack side dish or I guess just add some protein and it can be almost like a one dish main course!! Try it, I’m telling you, you will be hooked. There really is not a day I don’t just shove some veggies on a tray and just drizzle with some olive oil to thinly coat add a few shakes of salt grind my pepper mill and just shove into a nice hot oven and about 10 minutes later I have perfectly crunchy and soft on the inside roasted veggies!! 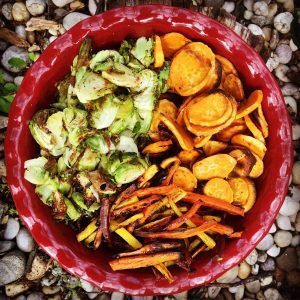 For this post I made Brussels sprouts, sweet potatoes and carrots. I first cut my Brussels sprouts thin, I find sometimes eating veggies it’s all in the texture and I like it small. The sweet potatoes I cut into thin silver dollar rounds and the carrots into thin spears, I find the thinner the yummier with the carrots (and normally I don’t like cooked carrots). I added my veggies to a metal sheet tray, it will give you the proper carmalization you are looking for. If you don’t own baking sheet trays u must go out and buy some, your lives will be changed forever, I promise!!! I then drizzled about a tbsp of olive oil and added salt and pepper to taste and tossed to coat. I put them in a super hot preheated oven set to 450 degrees and set my timer for about 5 min. Just toss the veggies around then put them back in for another 5 minutes and out comes yummy caramelized perfectly charred veggies, if they aren’t perfect yet for you just put them back in for another 5 minutes, just don’t forget them in the oven they can go from perfect to a little over charred fast. Enjoy!! 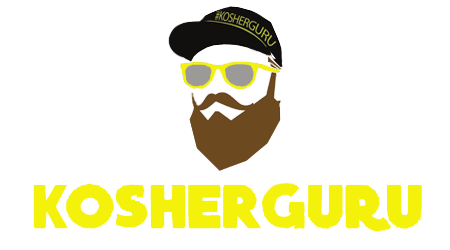 And keep following for more yummy products recipes and what’s new and trending in kosher.